Over the past several weeks, I've had the privilege to use the HP EliteBook Folio 1020, so here's my review on this beautiful enterprise-class notebook. The 1020 is a very thin, light computer that can be configured with a touch-screen so that you can easily navigate through your applications. 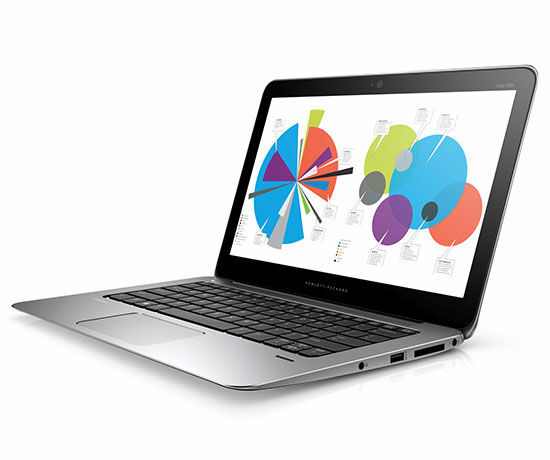 The HP EliteBook series represent their enterprise-class notebooks built to meet the highest business standards in mobile computing. Brief specs: 12.5" screen. up to 9-hr battery life. 2.68 lbs. 0.62" thin. In short: the design will remind you of a MacBook Air. The Folio 1020 includes enterprise-class features to keep health care data safe and secure. HP BIOSphere, HP Sure Start, HP DriveLock | HP Automatic Drive Lock, TPM Embedded Security Chip 1.2/2.0, and much more. There's a fingerprint reader (biometric security device) next to the keyboard. Medical professionals who are in the habit of carrying a laptop around the hospital or clinic will appreciate how the HP EliteBook Folio 1020 is so light that it's actually easy to carry in one hand. It's not always easy to find enterprise laptops that are 2.68 lbs and also feature touch-screen options. I believe HP is still selling the 1020 with the option to downgrade and run Windows 7. Since many hospitals are still running Windows 7, it's essential to find new computers that are capable of running Windows 7. The unit that I've been testing originally came with Windows 8.1 Pro. Then, I updated to Windows 10 Pro. Some may wonder why you'd need a touch-screen on a laptop, but I've found that navigating some functions is much faster and more intuitive when you can touch the screen. Also, if you're a medical professional and you're using this device at a patient's bedside, you can explain things much easier to a patient when you're both touching the screen to navigate through anatomy images, imaging studies, etc. This isn't a traditional "rugged" PC with rubber bumpers and a thick body, but it is engineered with no moving parts (no spinning hard drives or cooling fans) and meets MIL-STD 810G durability standards for drop, shock, and vibration. The EliteBook Folio 1020 connects to the HP UltraSlim Docking Station, so it's very quick and easy to switch between a desktop/workstation setup to a mobile computing workflow. I also appreciate the fact that this laptop also includes an illuminated keyboard (essential for radiology professionals working in dark rooms), multiple USB ports, HDMI, and a microSD card slot. The bottom of the notebook did get a bit warm at times, so the fanless design supporting the Intel Core M processor may need some additional refinement. If you prefer the 2-in-1 design (notebook + tablet) then consider the HP Elite x2 1011 (detachable tablet PC + various keyboard dock options). Bottom line: the HP EliteBook Folio 1020 is a great business notebook for users who are looking for a thin, light, durable solution that meets the highly demanding enterprise security requirements found in health care. A 12.5" screen won't be ideal for everyone, but it's the perfect size that provides sufficient productivity and optimal mobility.